With the cold winter months approaching us, it’s easy to forget that there are some people out there who don’t have warm clothes or a roof over their heads to keep them safe from the elements. But one company, and one customer service agent in particular is keeping that in mind this winter! It all started when Kelly Kinkel order a heavy winter coat from an online store called Zulily. Shortly after her order was placed, the package containing the coat was delivered to her front door. Despite the seemingly familiar routine, this online shopping order was not like any others in the past though. Kelly took to Facebook to share the heartwarming experience that unfolded after she realized the coat wasn’t going to work! “I just hung up from one of the best customer service experiences of my life. I ordered a winter coat from Zulily a few weeks ago. When I received my order, I could see through the packaging that the coat material wasn’t going to work well with the two breeds of dogs we have. Coarse dog hair and certain materials don’t mix. I called customer service and asked how to return the unopened coat for a refund. “I asked again how to send it back, and he said, ‘Please don’t send it back. I honestly thought he was kidding. It took me a moment to realize he was completely serious, and then came the tears. I just don’t know other companies that do this, do you? 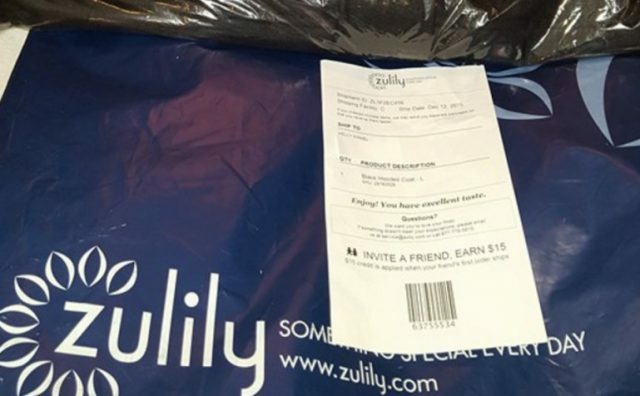 I thought Zulily was pretty incredible before, but after today, I’m a customer for LIFE. The world needs more LOVE like that. Without thinking twice, the massive company and its caring employees asked a customer to give back to those who were less fortunate. Just as Kelly said, this is the type of positivity and love that the world needs now, more than ever!